Lee Sprague, rice expert, shows Halley Guptil, a first-year from Clinton Township, Michigan, how to collect rice by using knocker sticks. Most people have broken out on the dance floor or in the rain to a rhythm, but I can say I’ve danced on rice. On Sept. 4 and 5, Albion College’s Whitehouse Nature Center held a rice harvesting workshop. The process of harvesting rice was explained and overseen by rice expert Lee Sprague, a 6-foot-7-inch, down-to-earth storyteller and ecologist. 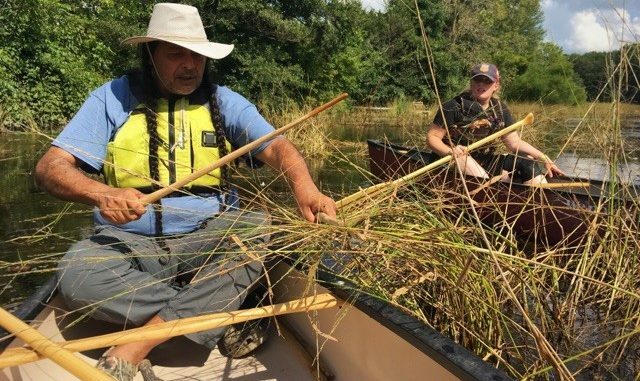 Sprague has been coming to the Albion area of the Kalamazoo River for the past few years in order to keep track of its wild rice population. Whitehouse Nature Center director Nicole Wood decided to invite Sprague to hold a workshop in order to collect more rice seeds for the restoration project. This workshop was meant to provide awareness of the rice crop and the devastating 2010 oil spill that impacted the population. To get the workshop group, made up mainly of college students, motivated for a long session of harvesting out in the sun, Sprague provided rice treats. All ingredients for the food provided were found and harvested on Albion’s campus. The smaller container holds the aftermath of heating rice and having it pop, similar to popcorn. The larger bowl includes cooked rice, maple syrup and berries — a savory, sweet taste. First, we gathered up the necessary tools. A rice hook — a long stick with two branches tied on the end to curve and form a shape between the letters “C” and “D” — is used. So are rice knockers — two sticks around the same length that have been scraped of their bark and smoothed. Gathering and making the tools for rice harvesting takes about as much time as harvesting the rice itself, Sprague explained. Next, we made our way toward the Kalamazoo River, where wild rice grows. After I had pushed a life jacket over my head and put on a bucket hat, Sprague told me to grab the jiiman. Looking around, confused, similar to when I was told to grab the knockers and hook. I waited for another lesson on an instrument of the harvesting process. “Jiiman,” Sprague said, is a way to refer to a boat that has “kissed the water.” In this case, a canoe, in Ojibwe, a Native American language. I climbed into the canoe, opposite of Sprague, and he paddled us down the river. As we traveled downstream, he pointed out the brown spots of rice found in the shallow Kalamazoo. Over the past few years, the brown spots — dried up, dead rice — have been declining. The healthily growing wild rice is lush throughout the eastern part of the river, near the front of the nature center. The Enbridge oil spill near Marshall, Michigan, in 2010 had a deadly, toxic effect on the Kalamazoo River. This oil contaminated the river’s soil and water, creating a dead spot for wild rice near the source of the spill. In recent years, however, the river is finally starting to become livable for native organisms. Despite being upstream from Marshall, Albion was also affected. I began pulling the rice toward the canoe with one knocker stick while crossing over it with the other, forming an X, and knocking them together. The rice fell into the center of the canoe. Since a storm came through the night before, many of the seeds had been already shattered. We collected more bugs and leaves than wild rice. 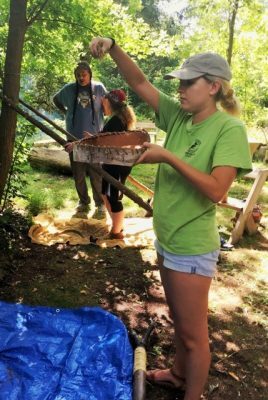 Sprague estimated that, over the past few years, about 20 pounds of rice was the maximum amount harvested at once in the Kalamazoo River surrounding the Whitehouse Nature Center. He was determined to ensure that we counted every seed, though, for they would be used to reproduce the wild rice further down the river. The seeds collected during the workshops will be used for the restoration project on the Kalamazoo River. Wild rice struggles to grow further down the river near Marshall, closer to the former oil spill site. The purpose of this project is to repopulate this portion of the Kalamazoo River with the native wild rice. Our next step was to scrape the bottoms of the canoes for the rice seeds. Our yield was small, and I found it hard to picture what a canoe full of rice would look like. Sprague said that the rice seed piles in the canoes could be near knee-high sometimes. Once the rice is collected, it will need to be dried for a few days. Normally, there are three tarps out marking how many days the rice is dried before heading to the fire to cook. If the rice is still wet in the fire, it will pop. He said to constantly stir the rice until it turned to a dark brown color, which usually took three to five minutes. Once the color darkened, it was ready to take to the jigging pit. A jigging pit is a hole dug into the ground and covered in leather. It is sided by two naked poles, which are scraped and smoothed tree branches. 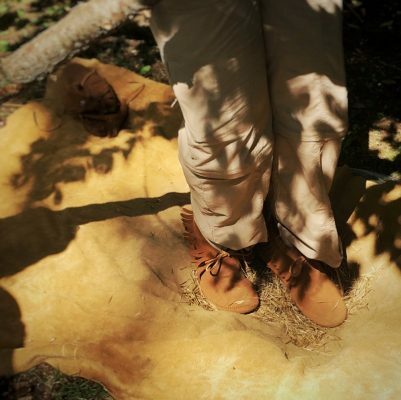 Throwing on a pair of moccasins, we took turns doing the rice jig, making sure to not touch the leathers on anything other than each other to keep the rice clean. Nicole Wood, Whitehouse Nature Center director, dances on rice within the jigging pit. In the hot, sweltering mid-afternoon heat, I found it calming to dance on rice. Holding the poles to either side of me in order to keep my balance, I slowly twisted my body from side to side. Hearing small crackling sounds as I grinded the balls of my feet against the rice was odd at first. As the chaff — the rice casings — started to build up in fluffy piles around my toes, I could see what an excellent core workout I had gained in the process of harvesting a key food source. Sprague called the rice dance the “empress of everything.” He went on to state how demanding the rice jig was. After all, the Saginaw Chippewa Tribe, of which Sprague is a member, takes pride in its rice harvesting tradition. The product provides a source of food that has fed families for decades. “If [the dancers] want water, then get them water, ‘cause if they get tired then you got to do this. Tell her stories. Tell her jokes. She stops moving, throw her out and get someone else in there,” he explained, jokingly calling himself lazy. In front is Kayla McQuinn, a third-year student from Freeland, Michigan, winnowing the rice over a tarp. Further back is Sprague and Guptil in the jigging pit. Gathering the rice into a birch wood basket, I headed over to a tarp to throw the into the air repeatedly to separate the rice grain from the chaff — an act called winnowing. The wind was not strong enough to blow the chaffs away and let the heavier rice grains drop, but it was easy enough to pick them out. The job was often left to grandmothers of the tribe’s families, said Sprague, as was picking out the leaves, bark and bugs. “Vegetarians are the best at picking out the bugs,” Sprague said, jokingly. Sprague went on to describe the people of his tribe and how the rice camps impact them. Wild rice has a cycle of “two years good, one year not so good, one year really, really good” making Sprague’s comment about harvesting rice “a decision that is life or death” really stand out. After all, harvesting rice is what his some members of his tribe do for an income and a food source. Even in burial, a small amount of rice will go with tribe members to the afterlife. The importance of such a simple and yet exhausting process is not something most people come across every day. I began to realize all the effort and sacrifice that goes into collecting a simple ingredient only after a few long hours. Sprague said he used to sell wild rice to shoppers. “They were happy, I was happy. What’s wrong with being happy?” he said. I would have to agree. I was happy harvesting rice. In fact, I might take up dancing on rice as my new hobby.